For a cancellation, no show or reduction in numbers. 80% refund on the balance of amount charged. 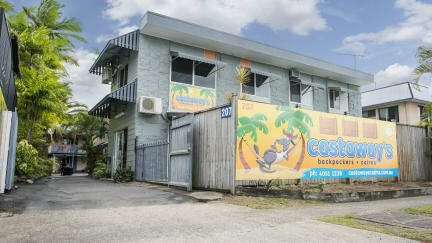 Enjoy free WiFi and access to a swimming pool and a communal kitchen at Castaways Backpackers Cairns. It is located 10 minutes walk from the popular Esplanade. Very much enjoyed our 4 night stay here. Staff super friendly and sorted us out with a great couple of tours. The place looks basic at first but we were very pleasantly surprised at how clean the room/kitchen/bathrooms were. Facilities were great - free pool table/coffee/tea etc Lot of workers staying there by the looks of it - but everyone we spoke to was very friendly and welcoming. 15 min walk from city centre with free shuttles and plenty food/drinking places within 2 mins. Thanks guys! I really enjoyed my stay . Iris was very helpful with booking my excursions and answering all my questions , Wayne the owner was very helpful and made me feel very welcome . Only stayed here one night for airport transfer. Close to the airport and they offer 10 dollar transfer which was brilliant. 30 minute walk into town only downside. Staff extremely friendly and loads of facilities (swimming pool, pool table, wii, cinema room, free slushies, town shuttle bus etc) great little hostel! Would definitely recommend and will return if we are in Cairns again! While a slightly longer walk from the heart of cairns Castaways is definitely worth not to be overlooked. With fantastic staff and possibly the fastest wifi you will find in Cairns they welcome you with open arms. A perfect stay when you need to unwind and catch up on planing, securing photos online or maybe your favorite series on Netflix. Helen was an absolute angel who helped us with so much! We did a lot of trips and weren’t very social so we can’t comment on that part of it but everyone was friendly and said hello! Plenty of facilities to accommodate everyone who was there. 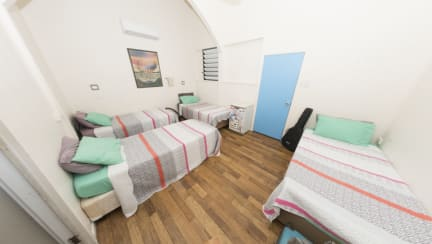 Not too far a walk from the city centre but the shuttle bus is there so no issue, would recommend anyone else to stay there whilst in Cairns for a relaxed, pleasant stay. Overall pleasent stay in Cairns, free shuttle service was very useful as it’s a 20 min walk into the main town. Very clean facilities as cleaned daily. Staff were helpful when it came to sorting out any problems or answering any questions. I enjoyed my stay here, it was really clean and the staff were really friendly and helpful. It is a bit of a walk into town, but they do offer a bus shuttle if you wish to use it. The only downside is that there was only 1 plug socket in the room. Although it had an extension lead with 3 sockets, for a room of 3 with multiple electronics each, it was a little annoying. Great location but strong party atmosphere which wasn't suited to me. Nice staff members and lots of advice about tourist sites. False advertising to say shuttle bus to and from the city. Phoned while on the greyhound to arrange a pick up, was told "we only do drop offs to the greyhound, as we won't know what you look like to pick you up". Absolutely ridiculous. Would never had booked somewhere so far out of town if I'd known. Got an uber there, only to find reception closed, when the receptionist got back she said she was out dropping people off at the Greyhound stop! Laughable. Cancelled the rest of my stay.